Hi Seas of Dulac, Inc.
About 16 miles outside of Houma, Louisiana, across a few drawbridges, lies a family-owned business that has sustained four generations of Authemonts. The office walls are adorned with taxidermy trophies of their hunting exploits over the years ranging from bobcats to deer. Hi Seas of Dulac was named in 1981 during the shooting of Vice President Eric Paul Authemont’s wedding day photos. The family’s love for the shrimp industry started with great-grandfather Alfonse Authemont Sr., in the early ‘80s when he made a living delivering groceries on the bayou in a row boat. He realized there was money to be made selling shrimp. As a side note, Raymond Authemont (Alfonse Sr.’s son and Eric’s father) and now president at Hi Seas of Dulac, says that in addition to shrimp, Alfonse got into all sorts of businesses through his grocery delivery business. He started acquiring fur, frogs and Spanish moss because no one had money in the area at the time to pay him. Once he had these things, he would resell them to others. Eric reminisces about the stories Raymond shared about his great-grandfather wearing the same clothes everyday, which included a white shirt, a tie and a hat. Alfonse had 10 children who shared a passion for shrimp. 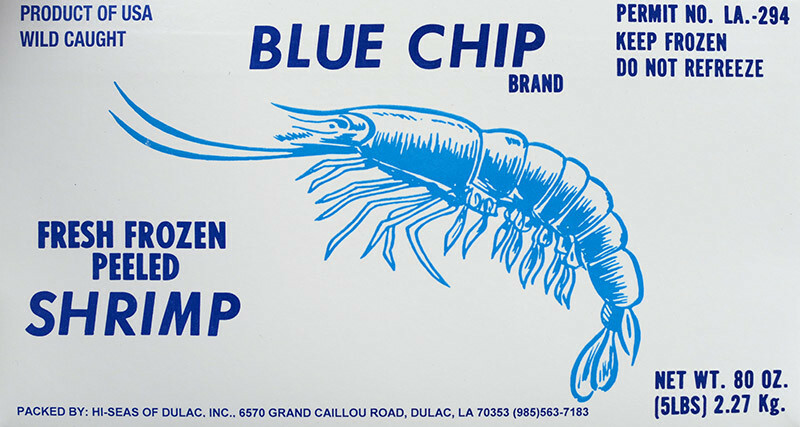 The ninth child was Alfonse Authemont Jr., locally known as “Cap,” which later became the name of a very popular brand of shrimp sold by the company. Raymond worked at the family-owned canning plant for many years before deciding to branch out on his own. During the first few years of the business, all the equipment was rented from vendors whom Raymond had met while working at the family shrimp plant. Sally Authemont, Raymond’s wife and current secretary at Hi Seas laughs about getting mad at Raymond for borrowing $1,000 from the bank. Sally wanted to go work for the local drug store to help out, but Raymond had different plans. He told her he didn’t want her working at the drug store, so he was going to find her a job. He built two shrimp dryers and handed Sally a shovel and a pair of gloves to get started. In 1975, a blazing fire burned the old shrimp processing shed the family had worked out of for many years prior to Hi Seas. Alfonse had used the shed to unload shrimp from local fishermen before he decided to get out of the shrimp business. Eric was pitching at a baseball game when he heard the sirens from the cars flying past the ball field. He immediately caught a chill and thought it might be his family’s place that was in trouble. When the school bus dropped Eric off that evening after the game, he was greeted by his grandfather consoling and encouraging his saddened mother. With determination in her eyes and a smile on her face, Sally shares that she didn’t want to start again. To further add to the loss that night, a shipment had been ready for pickup the day of the fire, but the buyer didn’t show up in time before the building burned. Cap told Sally that when you fall down you have to get back up. So Sally and Cap put their boots on and shoveled all the soot in a valiant effort to get the business back up and running again. A few years later, Raymond couldn’t help but notice that many canning plants in the area were throwing all their pickings away. Businessman that he was, Raymond just couldn’t bear to let it go to waste. So Raymond started spending his breakfast and lunch breaks loading up pickings from their own plant and other plants so he could package and sell “Crumbs” animal food for 25 cents a package. They called it “Crumbs” because it was produced from leftovers from the canning plants. In the early ‘90s, the Authemont’s ventured into IQF (individually quick frozen) shrimp with the launch of their product in 150 Super Kmarts. For two years, for every grand opening, Vice President Lance Authemont would load a refrigerated truck with shrimp and drive all around the country. The new product form required an education process with consumers. Because the product was so different from what they were used to, people would try to return the shrimp because it didn’t give off the strong smell of iodine that they were used to. Lance and Eric bought the business from their parents in 2005 just before Katrina touched down on land. The Authemont’s were very fortunate that they did not receive any damage from Hurricane Katrina. However, Hurricanes Rita and Ike flooded the facility. Hi Seas is currently renovating their facility to accommodate new machines for processing. The new machines have allowed them to process shrimp without conveyors, and this has reduced product loss. They think their great-grandfather and grandfather would be amazed at the new technology and would be quite proud of the operation. Hi Seas processes white and brown shrimp as block frozen shrimp both headless and peeled. They sell through distributors to foodservice customers all around the country. Lance and Eric may be the last Authemont generation in the industry, but they plan for it to be around for many more years. They have big plans for the future of Hi Seas.